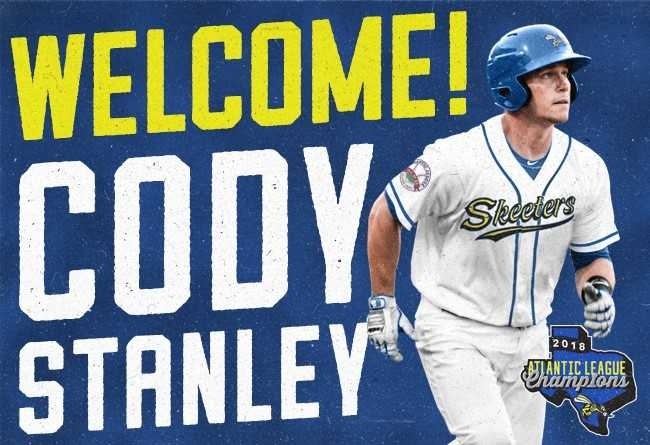 (Sugar Land, Texas, Feb. 7, 2019) - The Sugar Land Skeeters today announced the signing of former Major League catcher Cody Stanley. Stanley, 30, made his Major League debut in 2015 with the St. Louis Cardinals, going 4-for-10 with two runs in three RBIs through nine games played, accounting for the entirety of his MLB service time. The Cardinals drafted Stanley in the fourth round of the 2010 MLB Draft out of the University of North Carolina at Wilmington. He last appeared professionally in 2015 with Triple-A Memphis. Over six professional seasons, Stanley has hit .269/.321/.406 with 48 home runs and 295 RBIs through 540 games. Stanley has made 373 of his career appearances at catcher, also making five appearances in left field. Stanley was selected as a Midwest League Mid-Season All-Star in 2011 with Single-A Quad Cities and as a Texas League Mid-Season All-Star in 2014 with Double-A Springfield. He was also selected as an Appalachian Rookie League Post-Season All-Star in 2010 with Danville and as a Texas League Post-Season All-Star in 2014 with Double-A Springfield. While at UNC-Wilmington, Stanley was selected First-Team All-Colonial Athletic Conference his junior season. He also played in the Cape Cod League with the Cotuit Kettleers in 2009 and was selected to the league’s All-Star Game. The Skeeters open the 2019 season on April 25 at Constellation Field against the Southern Maryland Blue Crabs. Season tickets and mini plans for the 2019 season are currently available and can be purchased by visiting sugarlandskeeters.com, calling the TDECU Ticket Office at 281-240-4487 or by visiting the TDECU Ticket Office at Constellation Field during office hours. Individual tickets for 2019 will soon be made available.